Ryhope claimed their first win of 2019 against Shildon AFC coming away with a 4-3 victory. Former Shildon man Micky Rae and James Ellis both scored twice in a thrilling encounter at Dean Street. Ryhope were first to get on the score sheet as James Ellis’ effort from outside the box left Newbrook no chance in the Shildon goal. Almost twenty minutes later, Shildon grabbed an equaliser through Aidan Heywood as his effort flew past Atkinson into the roof of the Ryhope net. Early in the second half Ryhope regained the lead as James Ellis grabbed his second of the game, this time from the penalty spot. However once again Shildon found an equaliser, this time Greulich-Smith slotted the ball past Joe Atkinson to equalise for the home team. With fifteen minutes remaining Ryhope were awarded another penalty this time Micky Rae stepped up to once again give Ryhope the advantage. Four minutes later the away team were awarded their third penalty of the game, with Micky Rae again stepping up to give his side a two-goal advantage heading into the last 10 minutes. With 3 minutes of normal time left to play Moore setup an entertaining finish to the game after poking home as a result of the corner. After losing 2-0 in the reverse fixture earlier in the season Ryhope were hoping to take all three points from the hosts. 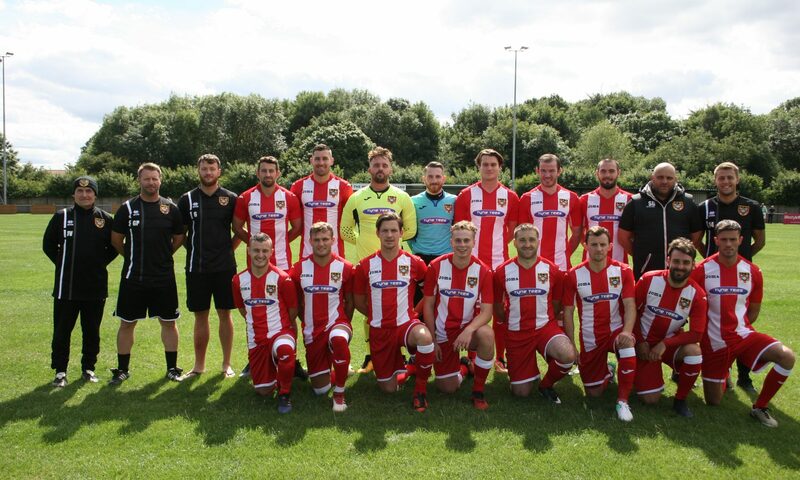 Shildon however were looking for their fourth consecutive win and to start 2019 with a win. Prior to the game, manager Gary Pearson made two changes to his starting eleven, bringing Chris Trewick and leading goal scorer James Ellis back into the team. Both teams started well with chances at either end, but it was Ryhope who took the lead on the eighteenth minute as James Ellis fired the ball into the top right corner of the goal from the edge of the box. After scoring the goal Ryhope looked dangerous, with chances falling for former Shildon man Micky Rae and midfielder Chris Wallace. On the half hour mark, Shildon started to come back into the game with defenders Carl Jones and Danni Lay producing great blocks to deny the home team an equaliser. However, Shildon soon found a way through as Aidan Heywood picked the ball on the left-hand side of the box and fired the ball into the back of the net to level the score. Heywood almost got his second of the game moments before half time however his effort flew narrowly over the bar. The home side started the second half the better out of the two teams with Atkinson denying Greulich-Smith with a good save. On fifty-four minutes Robbie Bird was brought down in the box by a Shildon defender leading to the referee pointing to the spot. James Ellis made no mistake, slotting the ball hard and low into the bottom right corner of the goal, giving Ryhope the advantage heading into the final third of the game. Ryhope’s lead only lasted for nine minutes as striker Billy Greulich-Smith was able to get on the end of a header to fire the ball past the Colliery Welfare goalkeeper. With the scores level Shildon had a good chance to take the lead for the first time in the game, but Robson’s clever freekick was saved by Joe Atkinson. With 15 minutes remaining Ryhope were awarded another penalty as Robbie Bird was taken down in the box, forward Micky Rae fired the ball into the bottom left corner of the goal to once again give Ryhope the lead. Four minutes later Ryhope were awarded their third penalty of the game and Shildon were reduced to ten men following Ellison’s second yellow card for a challenge on Nat Skidmore. Once again Micky Rae made no mistake hammering the ball into the back of the net to give Ryhope a two-goal advantage heading into the final part of the game. With three minutes left, player coach Daniel Moore was able to grab a goal back for the home team after prodding home from a corner, however he was dismissed following an incident after the goal had been scored. With a two-man advantage Ryhope were able to control the dying minutes of the game to hold on for their first win in three games. Up next for Colliery Welfare, they face an away trip to bottom of the table Penrith hoping to build on today’s victory. Previous PostPrevious Match Preview: The Ryhope Derby!